6 miles @ 8:40 average pace for my Friday morning run. 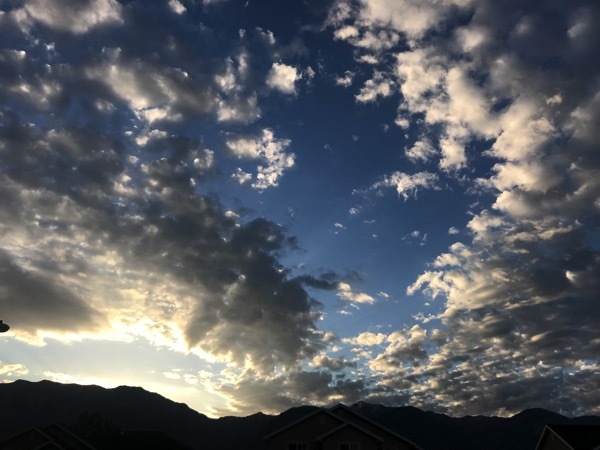 The sky (which I love even more now after naming Skye:) was gorgeous during my run. After I got home I did a bit of strength work with my resistance band (sharing the workout soon)! Yesterday the parents were invited to join in with the kids for recess at Brooke’s school. 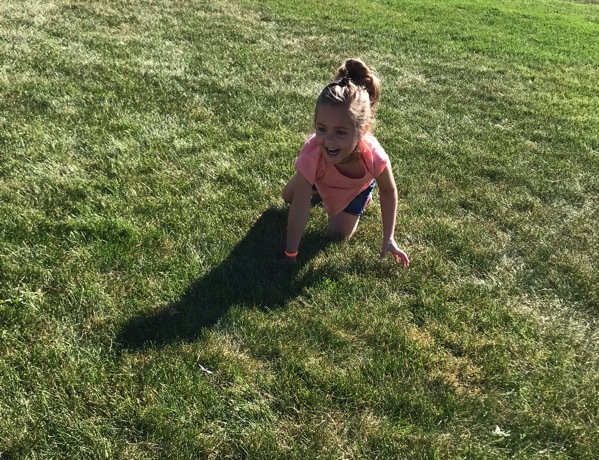 Brooke can pretty much go faster on her hands and knees than I can go running… she has mastered this skill after years of pretending she is a dog. 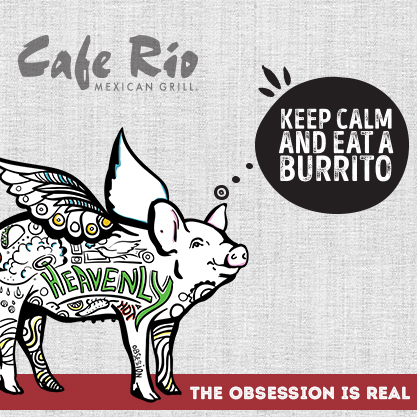 Is it possible to ever get sick of tacos? I’m guessing the answer to that question is no. And these powerballs made an excellent addition to my lunch. These things are addicting. 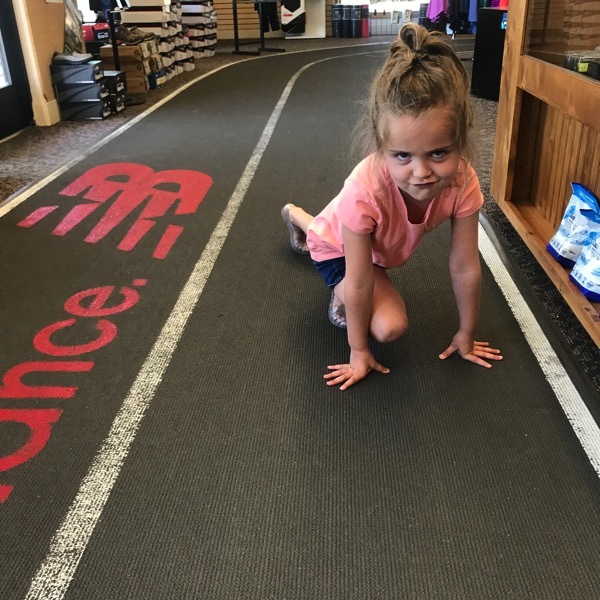 We made it over to the running store for a little while. Brooke ran around their little track 13 times which she says is pretty much a marathon. They had one of these Roll Recovery R8 tools there to test and oh my goodness. This is the first time I have ever used one of these and I couldn’t believe how good it felt. It was like a real massage and 20 times better than a foam roller. I am going to work really hard at convincing Andrew that we need this. Do any of you have this? What are your thoughts… worth the investment? 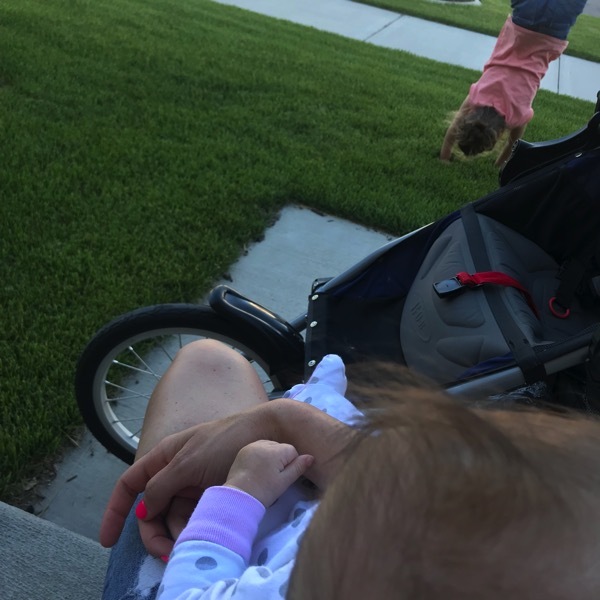 We had a pretty low-key remainder of the day with a trip to Costco (they had the best samples yesterday), an easy dinner, a walk and watching Brooke do one million cartwheels. 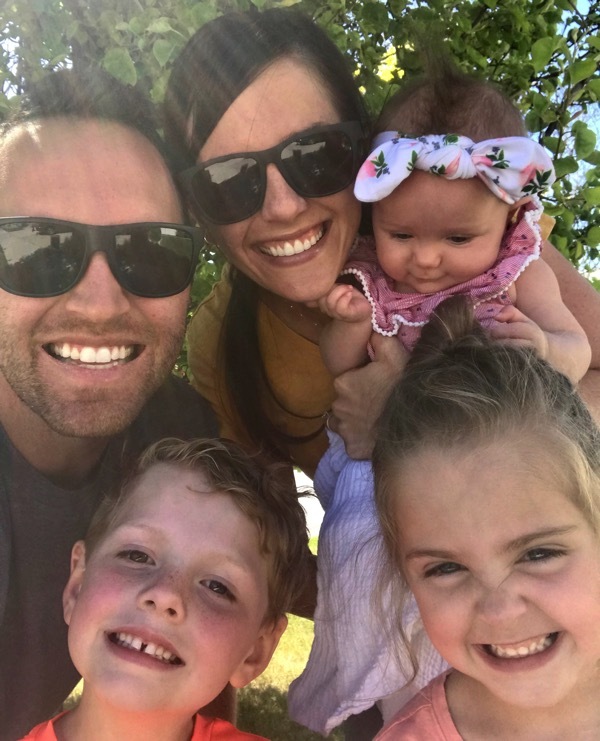 I’ve got a few Friday Favorites to share with you today! *My new swimsuit! 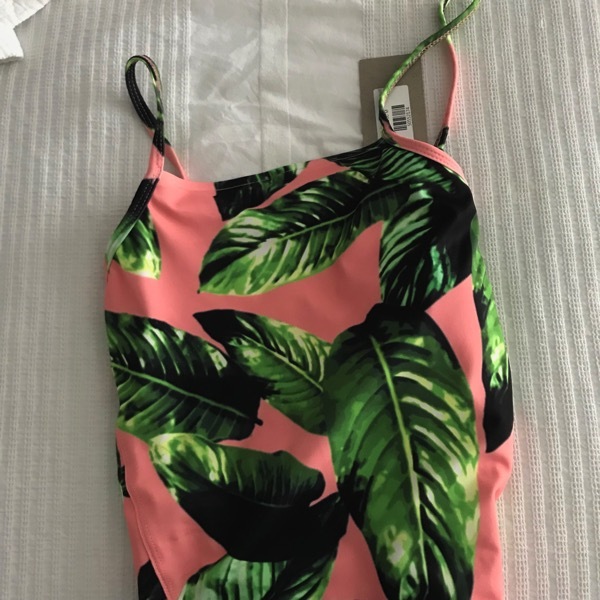 A few weeks ago I asked for your recommendations for good swimsuits and I got this one from someone’s recommendation to try out Albion’s swimsuits. I’m also ordering one from Athleta Swim (I just can’t decide which one yet) too because at least two swimsuits (that fit me) per summer is a need, not a want;) I feel like I was really lame last summer with the kids since I felt so sick from pregnancy so I’m excited to make up for it this summer and do more things with them. 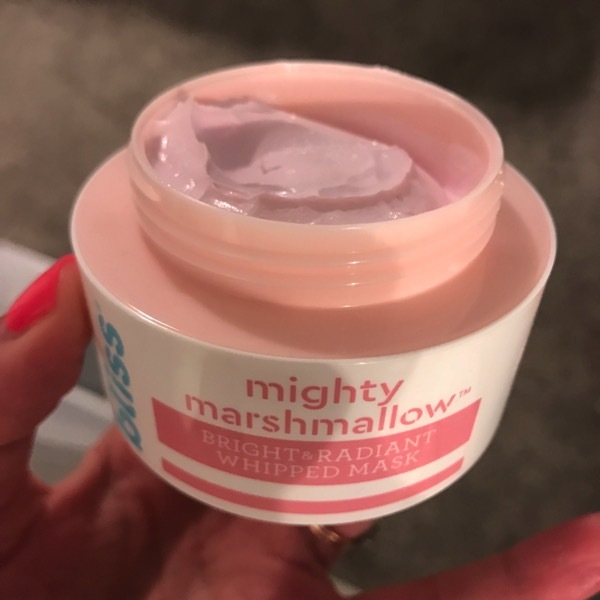 *A few of you recommended this bliss mighty marshmallow whipped mask and you were right about how amazing it is. It feels like heaven and my face feels so soft afterwards. It’s pretty cheap for how many face masks you get out of the bottle too. I’m in love. Thank you. 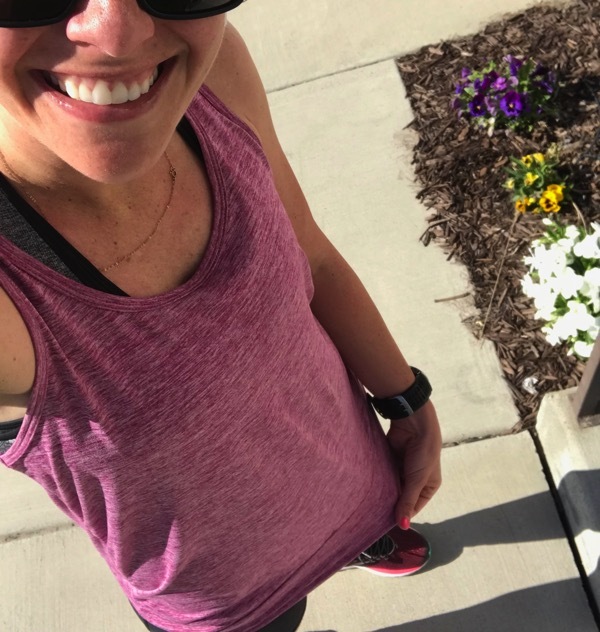 *I am really excited about this one—> This workout tank from Target is awesome. Andrew picked it out for me and it is so soft, LONG, loose on my stomach and the back is so cute. It’s $16.99 and they have a bunch of colors that I want to go back to get. It also washes really well. I LOVE a good cheap running tank. *I found the left sock of one of my favorite pairs of running socks after it was missing for a very long time. I don’t know how it showed up but I was putting laundry away on Monday and there it was, hanging out in the pile of clean clothes and I was pretty happy to find it. 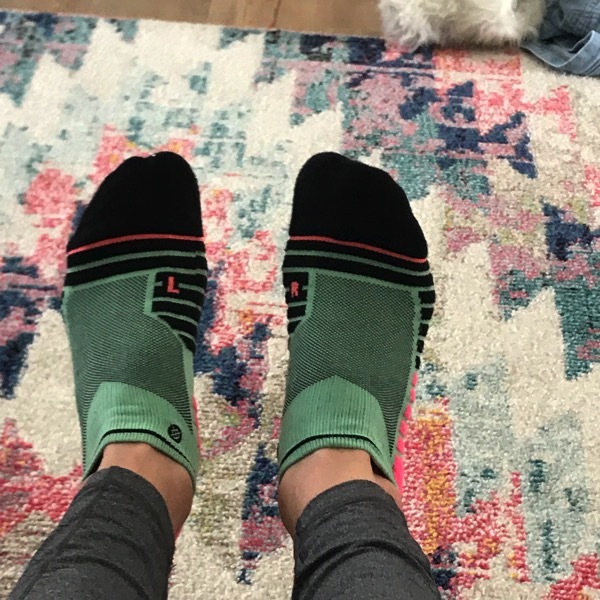 My top 4 favorite running socks—> These, these, these and these. *While we are on the topic of socks, I bought these and I’m trying them out for the first time today because I’ve heard a lot of great things about this brand! 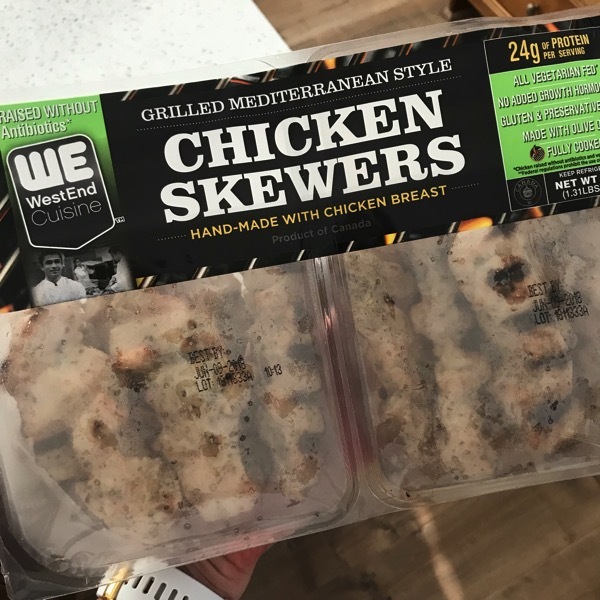 *Stephanie told me about these chicken skewers that you can get at Costco and they are really good. Just add some rice, a veggie or salad and boom… a super easy dinner. *This is Andrew’s Friday Favorite. 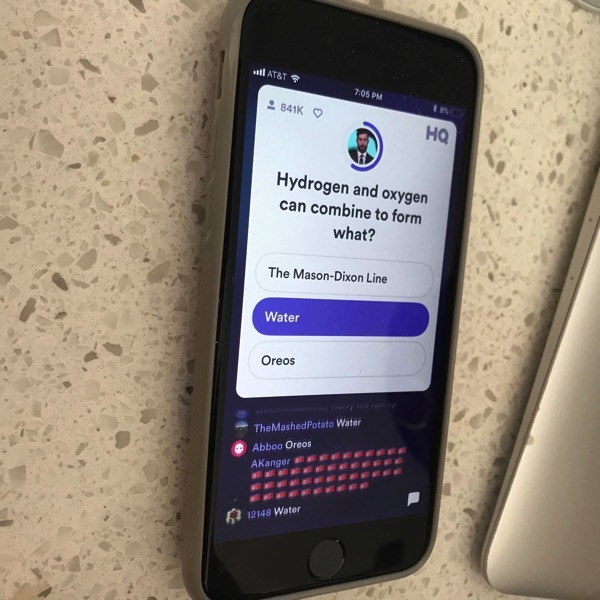 It is an app called HQ and twice a day they hold a trivia game and you can win money on it! It’s free to win and the questions start out easy and get hard! He loves it! Allie and Kim!!! 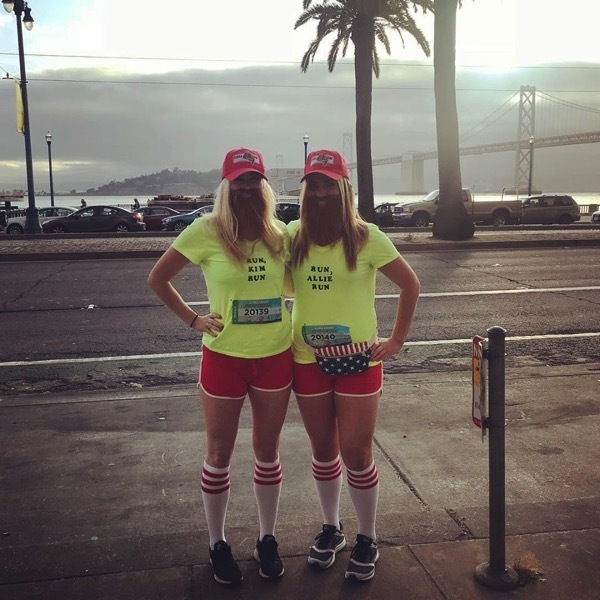 “We ran Bay 2 Breakers which is the oldest consecutively run annual footrace in the world (according to their website:) But really, it’s a fun day in SF where everyone dresses up in costumes and the route is one big celebration and party after another. In past years, we’ve just cheered on the race but this year we wanted the full on race experience! We decided to take on the 7.6 mile race dressed as Forest Gump and had a great time (even though running with a beard is way harder than expected)! Bethany!!! 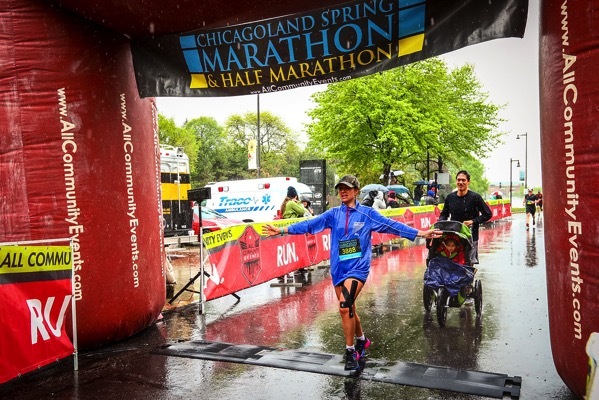 “Sunday morning, I ran the Chicagoland half marathon and it was by far, the best race of my running career yet! The crazy part is that on Saturday, I almost decided not to go. My IT had been tight all week long, leading up to the race and I was having some serious mindset issues. I didn’t know if I could run it, let alone PR, which was my goal leading into this race. But, after a major pep talk from my sister, mom, and my husband, I walked into the race feeling calm & semi-confident. It started off crazy, with a 30 minute rain delay (I didn’t come prepared for rain at all, so I ran in an over sized race expo fleece and Landon’s baseball cap, haha!) I ran the entire race with the best splits I’ve ever had in a half and felt super strong with my mental toughness! I came in UNDER my goal time and PR’d by 6 minutes! So STINKING HAPPY! Landon and my son ran the last .6 with me, in the pouring rain and brought me into the finish. Best race ever!” The full recap is HERE!!! Do any of you have the Roll Recovery R8?! What are your thoughts? Do I NEED it? What running socks do you love? Looking forward to anything this week? Triathletes, I just don’t know how you do it. 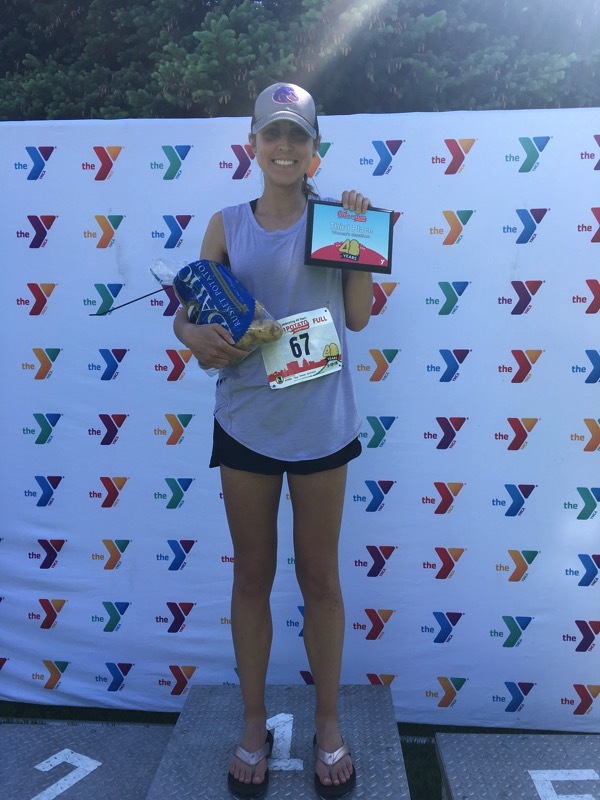 I want to run that Idaho race just so I can pose with a bag of potatoes at the end! Coolest prize ever! I’d have a bbq lunch after serve those potatoes up! Congrats, Maddie! RIGHT?! I love it… let’s all go and meet there next year! Have a wonderful day and did you make the trip to Chicago? Aw, you’re so sweet to remember. Nope, I’m at home. Hotels are crazy expensive and seem to have those hidden fees that jack the price up — not just Vegas hotels doing that anymore. The cheap trip suddenly wasn’t so cheap anymore. Darn… but there’s a Rock n Roll run in July so we may yet get over there. But I sure wish I was running through Soldiers Field tomorrow! That looks mad fun. Plan to run a small local 10k instead, it’ll be fun too, the children’s charity it’s for does really good work. I think I’m going to have to buy one. Thanks Mollie! YES… that is what always happens to Andrew. He pushes it too fast and then tries so hard to change it. I hope you have an amazing day! #1 running socks: Thorlos. They’re all I run in. They have extra cushioning at the heel and the toe and less cushioning where you don’t need it. LOVE when socks have L&R labels. All my life I’ve thought there should be left and right socks, but pairs that distinguish are so rare. Have an awesome Friday!! Hope Andrew is recovering!! Cook him extra of those chicken strips and make him eat extra yogurt (or whatever dairy alternative with Calcium— CHEESECAKE?!)!! Gotta get protein to recover! HEY!! I have never tried Thorlos.. I will have to get a pair to try. YES, I love the label too but I can’t tell you how many times I have put them on the wrong feet. Good idea on the extra calcium (you have an amazing memory–> He loves cheesecake. Thanks and I hope your weekend is amazing. The roll recovery is AMAZING! I don’t have one but I’ve used it a bunch and am also considering investing in one. I def think it’s worth it. Yep, we are going to go for it now. Have an amazing time in New Jersey… that sounds perfect. Thanks Arthi. My friend told me about HQ earlier this week, and I am hooked! I love that app! Also, I’ve had those chicken skewers from Costco, and they are absolutely delicious. I’m looking forward to lots of sleep, beach time, hanging out with friends, and three days away from work this weekend. Hope y’all have a wonderful weekend, Janae! I have a Roll Recovery R8, and it is SO worth it! It’s easy to travel with (I take mine to work and use it when I am reading/researching). It works so well and I think it’s way better than a foam roller. We are going to go for it Kelly! Thanks for telling me about how much you love it and that it’s easy to travel with it… I can’t wait to have my own. Have an amazing weekend. I have the R8 roller, and I LOVE it! Definitely worth the investment, I think. The one downside is that it’s not great for calves, or at least is a bit difficult to master for that area, but I seriously love it for quads and hamstrings! This is so good to hear! We are gonna get one. Thanks Catherine for taking the time to let me know that you love ours… I’ll be thank you soon again when ours arrives. Have a great weekend! Awww! Skye always looks soo happy, it makes my day! Those chicken skewers are amazing! I am looking forward to spending time with my parents and going to our favorite cupcake spot! Did the vital proteins stuff work for your hair? Any recommendations? Hope you have a fantastic weekend! HEY AMBER!! SO I have been using them and I think they are making my hair stronger and healthier but I am still losing a bunch of hair. I just started a hair vitamin that Andrew recommended for me that he learned about in his nursing class and I’ll talk more about it next week and if it starts working. It’s from Costco and it is in a pink bottle (I got the gummy version). The brand is Nature’s Bounty Hair, Skin and Nails Gummies w/ Biotin. I hope you have a great weekend and I’ll keep you updated if I find anything great. Thanks! CONGRATS TO YOU MADDIE!! Thank you for sharing it with me so that I could post it! Have a wonderful weekend! PS I LOVE your Albion suimsuit!!!! Gorgeous print!!!! NOOOO I’ll keep my fingers cross that you get the same luck that I did. I think you are smart for holding onto it. Have a fabulous weekend Jenny. Balega are the only socks I wear for running. They are really amazing! Also, I bought the R8 about 3 years ago and it is 100% worth it. I bring it with me when I travel for races and it fits easily in a backpack. Get it! That is so true… it would be awesome to bring when I travel for races. You guys have convinced me… we need one. Especially since we have two runners that will use it, that makes it half off right? Have an awesome weekend Ali! Girl, I am shocked that you do not have the R8. You and Andrew NEED to have this tool in your staying healthy arsenal!!!!! Running socks—for when I’m not worried about sock tans, I do like mid length Stance socks :) For sunnier days, I wear Balegas, but I’m not sure which model–kinda a mid-weight. Looking forward to? Long weekend! Fusion yoga tonight! Eating out and spending time with my family this weekend! My youngest daughter’s birthday next Friday—have her cake ordered from a yummy baker and just added a dozen of her homemade macarons to the order. I can’t resist an amazing macaron. Choosing the flavors was HARD, HARD, HARD though! I ended up getting a mix of blackberry/raspberry/coconut/lemon/salted caramel/vanilla latte. Oh my. Have a GREAT holiday and a FUN FUN FUN weekend!!!!! We are going to buy one today… after hearing so many of you loving them, we are going for it. Oh the mid length Stance socks are awesome too. Sounds like the perfect weekend and I think you chose the perfect combination. Now I need a macaron. Thanks for what you said about the swimsuit. Enjoy your long weekend and the birthday party coming up next week! 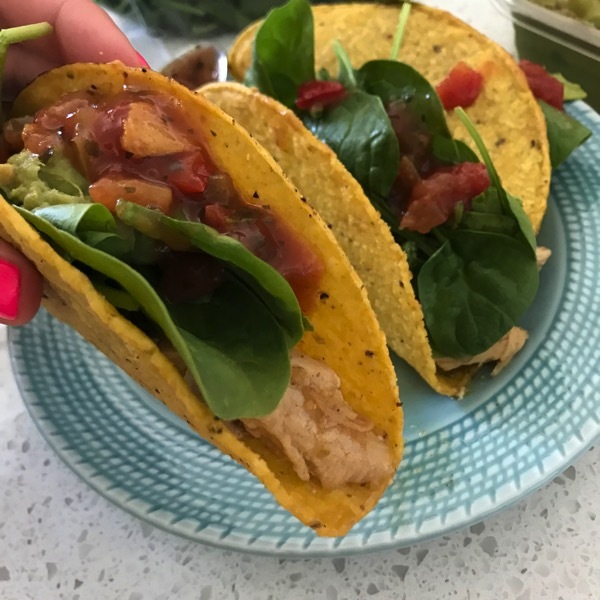 Your taco filling looks so delish! Recipe please!! Have an awesome weekend!! And then I added spinach, Wholly guac (from Costco) and peach salsa (also from Costco). Try it and let me know what you think. I hope your weekend is amazing! Thank you very much! I can’t wait to try it! I got the Roll Recovery R8 for my husband last Christmas. He loves it. It’s a bit intense but it does a great job. Excited to try those target tanks, I need some new ones. We are on our way to watch our nephews compete in the high school state track meet. Their relay team qualified! SO GOOD TO HEAR! We have to get it:) Let me know what you think of the tanks, I love them. Enjoy the track meet… your nephews are amazing. Have a fabulous weekend Corrine. My fiancé and I have that R8 Recovery Tool and it is a game changer! 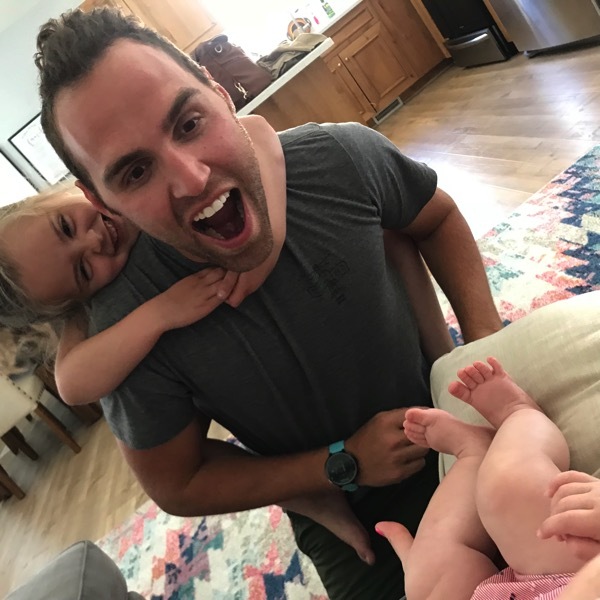 Not only is it great for general tightness and pain caused from running, but my fiancé was also experiencing really bad tightness in his IT band and hamstring following surgery for an ACL tear and it really helped with that as well. I find it a little scary to get on and off since it’s so tight but once I get rolling (no pun intended!) it does feel so so good and does wonders for my chronically tight hamstrings and sore IT band. This is so good to hear… I think we NEED it then. I am so glad it helped him with his IT and hamstring issues after surgery. BAHAH I loved your pun! Thank you so much for taking the time to let me know how you guys like it, I really appreciate it. Have an amazing weekend Stacey. I’ve never seen that recovery thing but it looks AMAZING! Anything that helps you feel better is a good investment in my mind! I am not looking forward to the 90+ degree weather coming up this next week but its a short work week thanks to the holiday on Monday, so I will just deal with it. Rhiannon. I am so so sorry. This breaks my heart. I HATE SIDEWALK CRACKS! Wish I could bring you a treat. Will you please let me know how you are doing? I feel your pain… those sidewalks have gotten me so many times. Thinking about you! You are too sweet! I am okay – just bruised and scraped up and sore! The doctor checked out my hands and luckily nothing too serious, just need to keep everything cleaned and protected. I am going to the chiro to get an adjustment because I think my back is a little out of sorts from landing hard. Honestly, I’m just glad it happened on a Friday so I can have an easy weekend and get plenty of rest! I don’t have the Roll Recovery R8 so can’t really speak to it. Socks, yes :). I love Stance running socks (I see you are wearing a pair in one of the photos?) and also the Feetures Elite Tab – the thinner ones. And then I do use the CEP colourful compression sleeves as well. Anything with bright colours and patterns is a win in my books! We are headed up to Squamish tomorrow – which is local for us – only an hour or so away – there is a race series going on and I am looking forward to having fun on the trails – 18kmish and then chilling for the day. YES, I agree… bright color socks are better than normal ones! Have an amazing time on the trails Kristine, it sounds so fun! THANKS. I have the R8!! I love it (and own a foam roller and stick roller). I’ve never been able to get my hamstrings/back of my legs well with the other tools, but the R8 really gets ya! I’m going to have to get it… my hamstrings have been begging for this. Thanks Amy for letting me know your thoughts, time to purchase. Have a fabulous weekend. Mmmm….tacos….having them tonight! And swiftwick socks are my favorite! Let me know how they taste tonight! Oh Swiftwick is awesome too. I haven’t really delved into getting specific socks for running, though I do prefer the one Balega pair I have over the other ones I have. This is so good to hear and it makes me realize we really do NEED this. Thank you so much for taking the time to write to me about this Shirin. Have a fabulous weekend. I want a roll recovery r8!!! Badly!!! Don’t know if I can REALLY justify an extra expense right now, but it would be nice to have. Super excited you’re giving thensocks a try. I also love Stance and have a few pairs that I got at an outlet store I found by my parents’ place in FL. A few days ago I tried a pair of drymax that was co-branded with Road Runner Sports (the running store where I now have a part time summer job…) and I liked them tova surprisingly large degree. I have never worn Brooks running socks even though I am a die hard Brooks fan. Those chicken skewers—if I could turn my whole body into an exploding heart emoji I would. I think they will be my dinner tonight with some diced cauliflower and pesto sauce and shredded baby spinach mixed in!!! Okay, we are going to have to try that combo with the chicken skewers. Thanks again Stephanie. 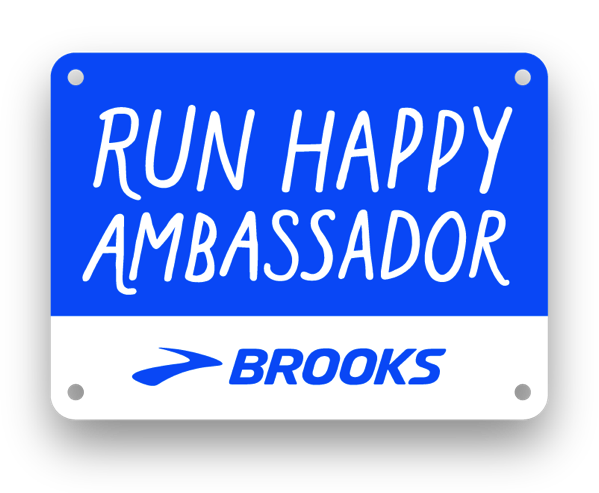 Try out some Brooks socks and let me know what you think:) Have a wonderful weekend Stephanie! I hope your weekend is excellent, too! The R8 is definitely worth the investment. I have boys who run XC in high school and college and they both swear by it, too. We all love Balega socks. I have never gotten a blister and they last so much longer than Smartwool socks. This is so good to hear. You guys have convinced me… we are going for it. 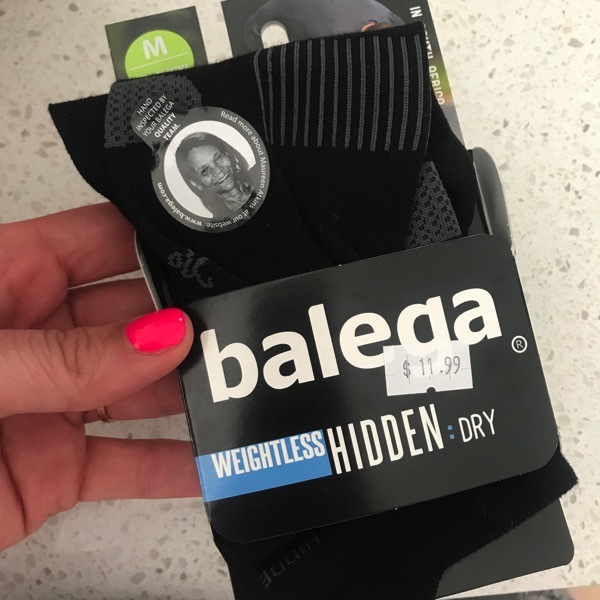 Good to know about zero blisters with Balega… thanks Michelle. Have an amazing weekend and that is awesome that your boys are high school and college XC runners. 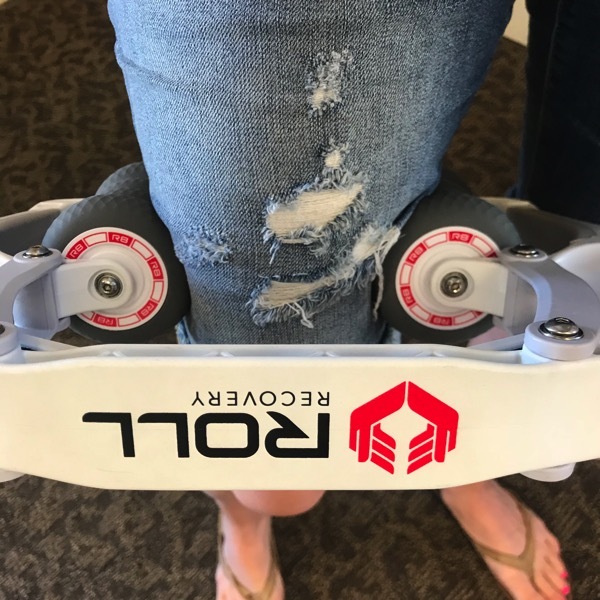 We got the older model RollRecovery for half the price when the new black one came out. We love it. REALLY!?!? I need to find an old one… half the price? And if I can’t find an old one I think I’ll need the new one! That is awesome. Thanks for this tip! Did anyone win the name guessing contest before you had Skye?? I sent her some new running shoes:) I hope you have an amazing day. I just tried the Feetures socks this morning on my 7 mile run and they are fantastic, I have to go back on amazon and buy some more!!! Oh that makes me happy! They are the best! Have an amazing weekend Peggi! Great family picture!! Love the bag of potatoes she got as a prize!! Haha I just bought Girl, Wash your Face and Let Your Mind Run last weekend after your recommendation and am so excited for both!! I love Balega socks as well as Smartwool. Normally find myself trying new brands when they are in the sale bin at the running store.😊 That was how I tried Balega. Find them to be nice and thick and supportive. This upcoming week…I just may book an impromptu flight to VANCOUVER WHAT??!! I’m super duper nervous but I’m looking at all the flights now…. Thorlo socks are my favorite. And such a cute suit! My sis in law had a suit from Albion last summer and it was darling and had great coverage for playing with her little ones. Love the running accomplishments. The prize potatoes crack me up! The R8 is a MUST! It’s our favorite. 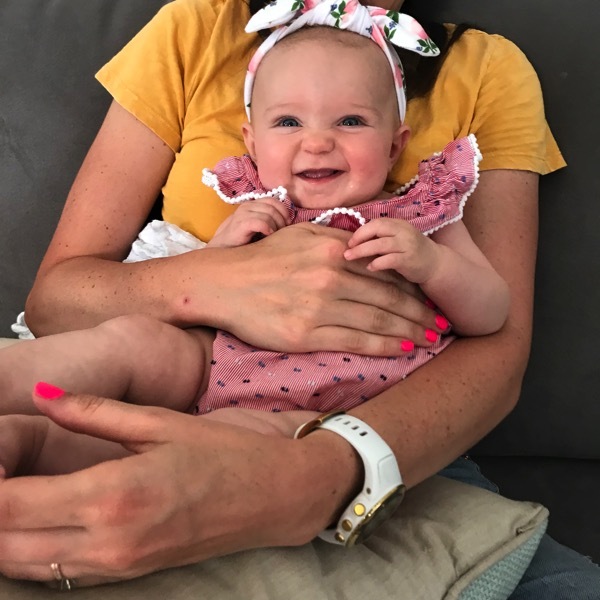 I’m good friends with the owners of the company and they are wonderful people and she (Adriana) just had her first baby! She’s also a 2:26 marathoner 😉 you’ll love it, Janae! Totally worth it. 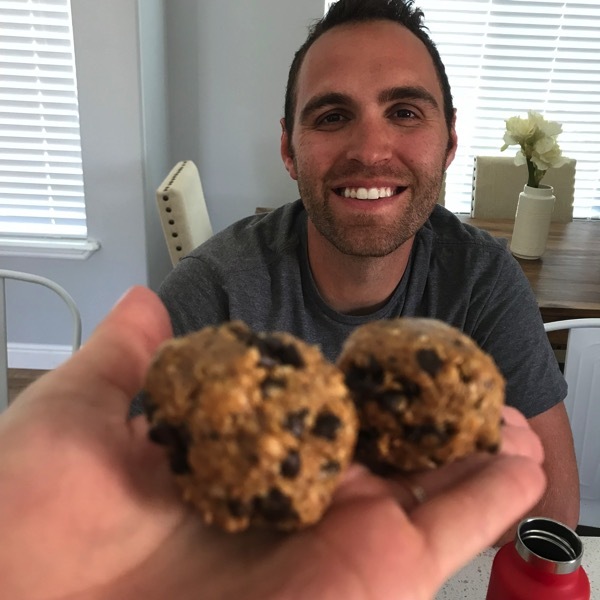 Glad you are loving the power balls! You better believe I am getting that tank from Target. Have a fun weekend! Thank YOU for sharing my race today! 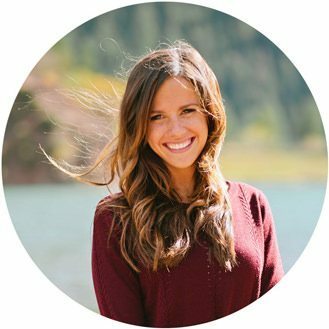 So fun to see what all the other amazing women have done recently too! I’ve been wanting to try out the R8 for a long time too! I am thinking with some big upcoming goals that I want to be chasing down in the upcoming years, it would be a good investment!! It looks like it would feel SO good! Yes on the R8! It’s definitely worth the investment! I use it way more regularly than my foam roller, and I swear it has made a big difference for my recovery. I recently got an Addaday stick, which I find gets areas my little spikey ball (think golf ball size) and foam roller cannot. I considered the R8, but the price was a bit higher than I am willing to pay at the moment. I knew the Addaday stick would work for me, but I still tested it before purchasing it at an expo. My fave socks are Balega for most running but I don’t wear them for marathons. Then, I wear Injinji’s because they protect my toes from blisters. I know people say “Eww” when I say there’s a “finger” for each toe, like gloves, but I find them really good. Also, please tell Andrew that I too am an HQtie! The most I have right so far is 10. Mind, it’d be disappointing to get them all right and then find $5,000 was divided amongst 189 people, as usually happens! To get about $0.69 for such brilliance would be totally sad! Yes, you NEED the Roll Recovery! My husband got me one for Christmas (although I think he uses it even more than I do). We love it! My favorite running socks are Experia with Thorlo pads. I don’t run in anything else. Nothing to look forward to this week. My feet still hurt from a 100 mile relay last weekend (they don’t hurt barefoot or in flip flops but real shoes at work tonight did not go over as well as I planned) and we have a tropical storm rolling by this weekend. And Roll Recovery! Saw it in another post. I have it (got if for my birthday) and it’s great! I will admit, though, I was surprised by the price tag! I own a Roll Recovery since christmas (thanks, grandpa ;) ) and I absolutely love it. I use it way more often then I do foam rolling (or did it before I hat the R8), because it is so easy to use while watching TV or being on the phone or whatever… you don’t need to lie on the floor uncomfortably. And I also feel like the effect is more immediate (tension release) while you also cann work on the tight spots very precisely. So: I definitely recommend getting oine of these!